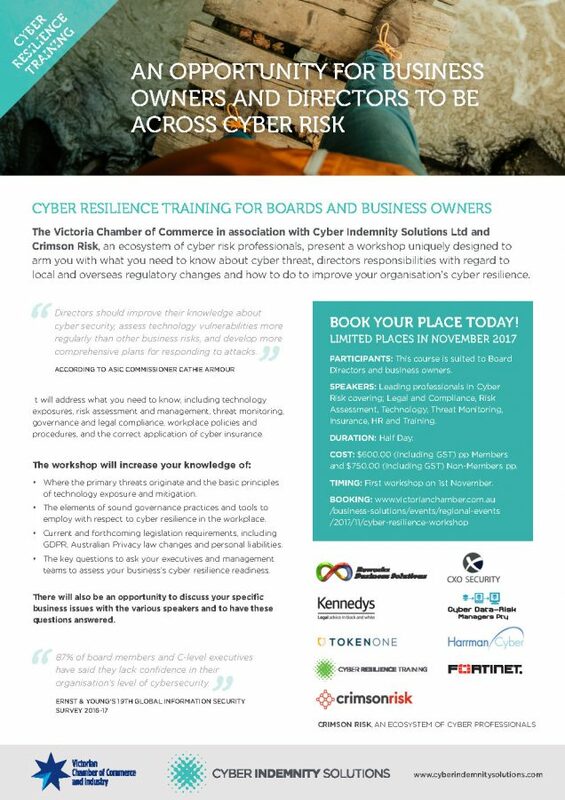 The Victoria Chamber of Commerce in association with Cyber Resilience Training Pty Ltd and Crimson Risk, an ecosystem of cyber risk professionals, present a workshop uniquely designed to arm you with what you need to know about cyber threat, directors responsibilities with regard to local and overseas regulatory changes and how to do to improve your organisation’s cyber resilience. Directors need to understand and approach cybersecurity as a business- wide risk management issue, not just an IT issue. Directors should understand the legal and personal implications of cyber risk, especially the impending legislative changes. Directors should empower management teams to assess and manage risk and build awareness and best practice into the corporate culture. “Directors should improve their knowledge about cyber security, assess technology vulnerabilities more regularly than other business risks, and develop more comprehensive plans for responding to attacks” according to ASIC commissioner Cathie Armour. Please visit the The Victoria Chamber of Commerce website to reserve tickets and complete payment for this very informative event.